"30 Miles to Yellowstone Park"
This whimsical postcard was produced in 1907 for Rueckheim Bros. & Eckstein of Chicago, the makers of Cracker Jack, as a promotional advertisement (prizes in every box did not begin until 1912). 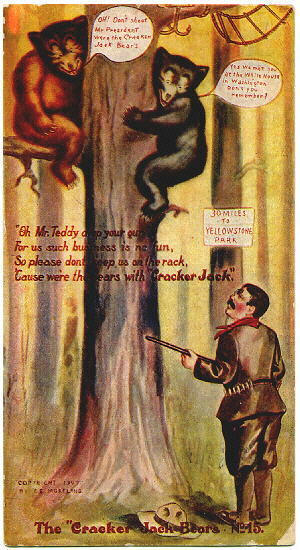 The card made good use of the era's current postcard craze, the popularity of its President Theodore Roosevelt, and the country's infatuation with the teddy bear. After a famous incident a few years earlier in which Roosevelt refused to shoot a captured bear, the "teddy bear" became a permanent part of American culture. * "The stuffed bear associated Roosevelt with a lovable and cuddly identity..." (Keith Melder's Hail to the Candidate, Smithsonian Institution Press, Washington, 1992. p. 130). This was one of 16 "Cracker Jack Bears" postcards sent "free to anyone who will mail us ten sides from Cracker Jack packages reading 'The more you eat, the more you want.' "
Only four years earlier, in April 1903, President Roosevelt enjoyed a much-publicized camping trip to Yellowstone (see Camping with President Roosevelt), which included his dedication of the stone arch at the north entrance (see photo at bottom of page). Though in this postcard TR appears "ready for bear," in reality he made it clear before his visit in 1903 that he had no intention of hunting while in the park. OH! Don't shoot Mr. President, we're the Cracker Jack Bears. Yes we met you at the White House in Washington. Don't you remember? Cause we're the bears with Cracker Jack." 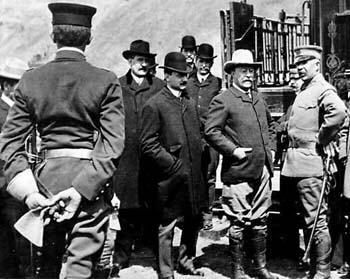 President Theodore Roosevelt with Yellowstone's Acting Superintendent Capt. John Pitcher as the President arrives at Cinnabar, just north of Gardiner, MT, to begin his tour of Yellowstone National Park in April 1903. An account of this trip entitled Camping and Tramping with the President was written by Roosevelt's camping companion at Yellowstone, naturalist John Burroughs. (photo: from the National Park Service Historic Photograph Collection).